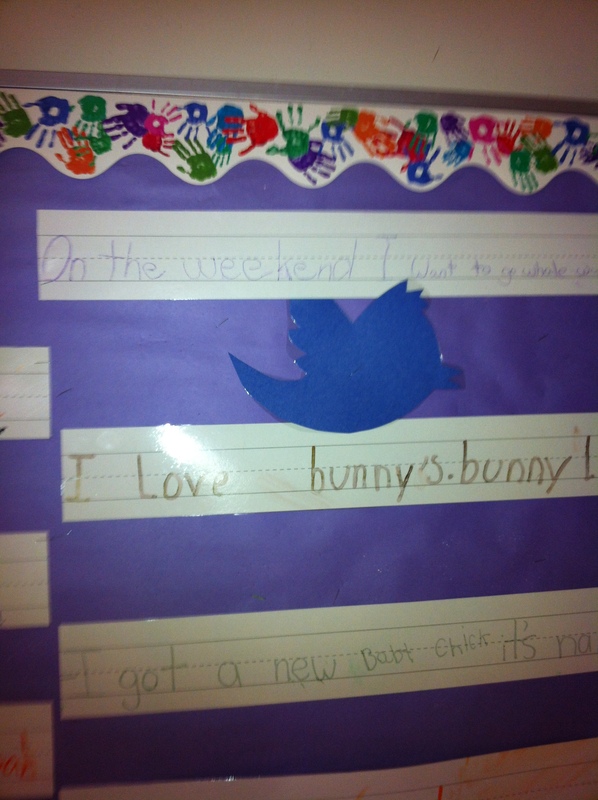 Twitter | Mrs. Anton's Class! Another Year of Fun with Technology! 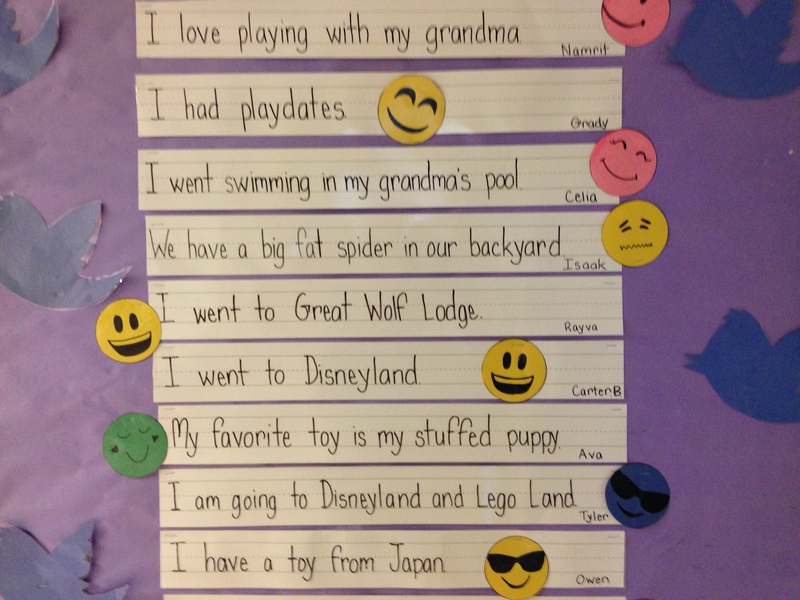 We have been having a lot of fun during the first few weeks of this school year! We have had a lot of fun creating a book using the iPad based on a story we have been working on in one of our readers. The story focuses on introducing the school in the story. 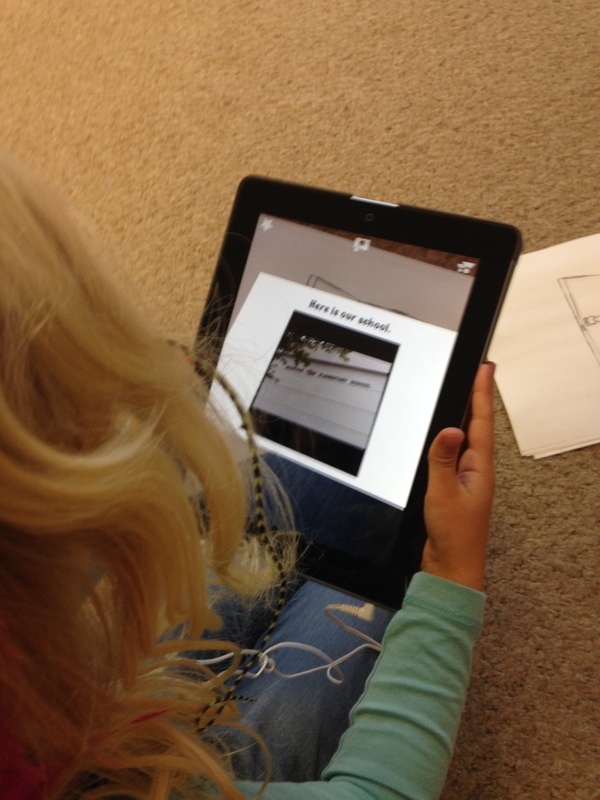 We decided to create our own book about our own school using the iPads. We had a great time travelling all around the school taking pictures of the important sites in the school according to the children! Then we imported the pictures into an app called Strip Designer and added the text. 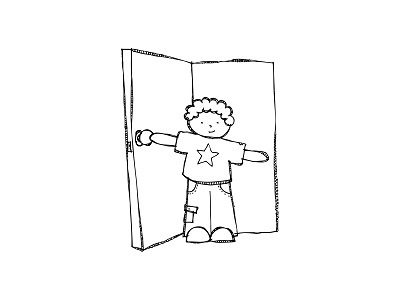 Then we imported these pages into another app called Explain Everything to create our book. Then we recorded our voices reading the text. 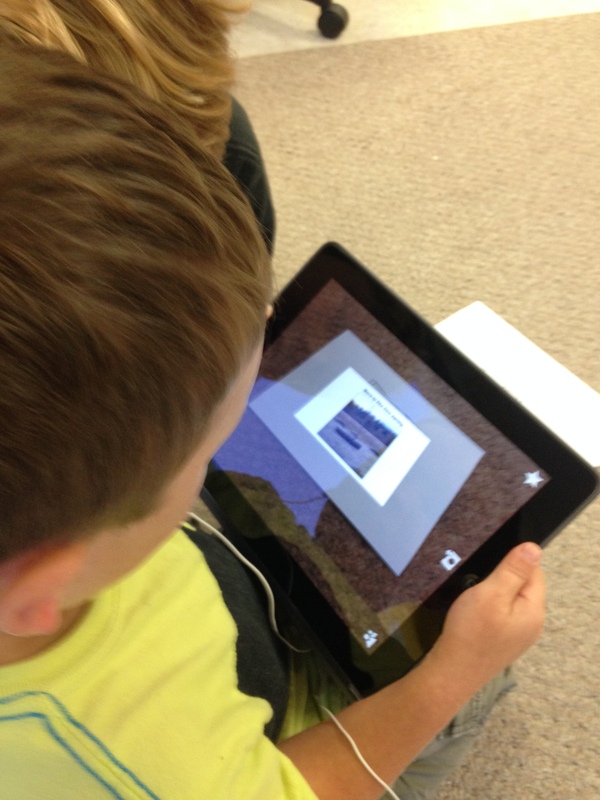 We saved our book to the camera roll and exported it to Youtube. We hope you enjoy our efforts! I have also been experimenting with Aurasma again this year. This app allows us to attach files to a trigger image such as a picture. When you view the picture within the Aurasma app it triggers the attached file to display. 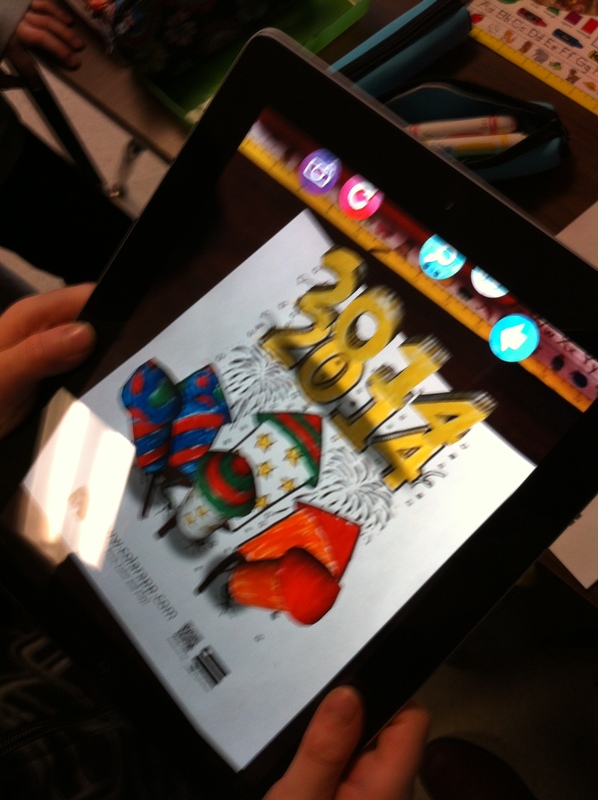 You need to follow our class on the Aurasma app to see the Aura. To see our auras, please follow the following steps. 1.Download the app Aurasma on your device. It works on iPads, and iPhones. I believe there is also an android version. The app is free. It will ask you if you want to register. You do not need to register to see the auras. You can do this by choosing the magnifying glass icon at the bottom of the screen. Type in either site name. Our channel should come up! (I have tried it on every device in my house and had my family try it so it should work!) Then choose the Follow button. The text will change to Following. You should then see a little snapshot of the picture above. 3. You can then trigger the aura by choosing the option at the bottom of your screen that has the four corners (the one in the middle). Aim your device at the trigger image above on this screen on your computer and you will see the aura activate with a purple swirl. The attached file should then display. The attached file is the book that we created above. It is pretty cool! Now you have two ways of viewing the same book!. 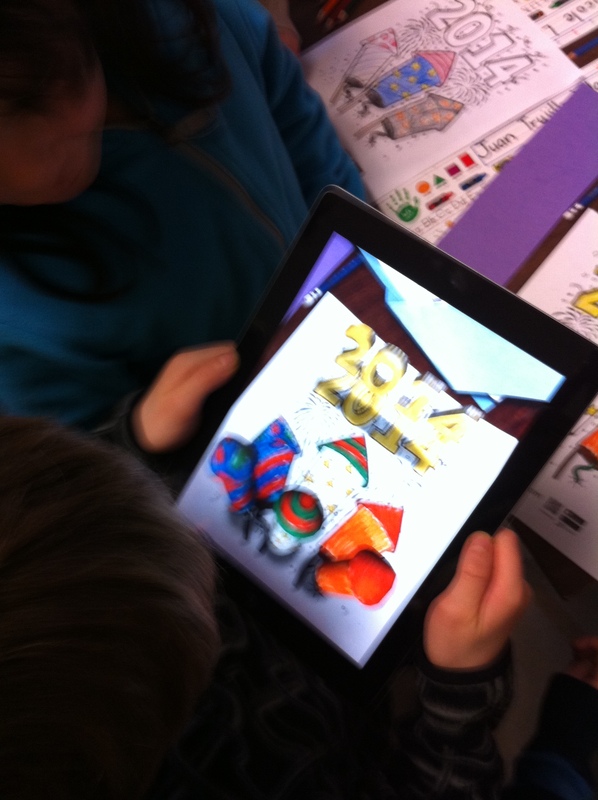 We tried it out this morning in our classroom with my iPad and the pictures! Lots of fun! As we create other auras this year we will share them to this channel. You can share the aura by choosing the share button. You can share it via email or twitter. I have also shared the book on our Twitter site. 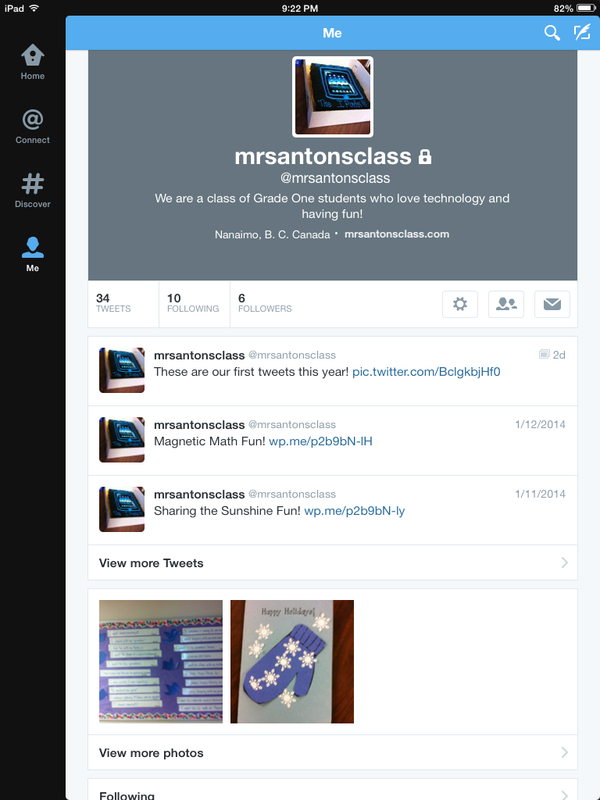 Our twitter address is @mrsantonsclass. I have added the twitter feed to the blog on the right hand side! You can see some of our tweets. Today we tweeted about the Global Read Aloud 2014. We have joined with a large group of teachers worldwide who are completing an author study of the Peter Reynolds stories. This week’s book is I’m Here. 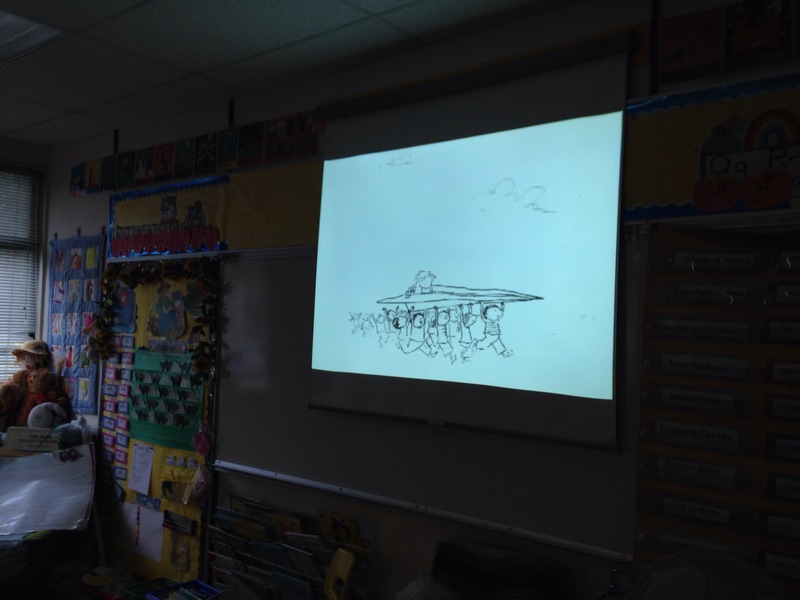 We watched the trailer about the book. Then we posted about it using the Global Read Aloud hashtag. You can see our tweet in the twitter feed on the side of the blog. We are hoping to connect with other classrooms in the world and find out what they think about the books too! Isaak’s Mom has voluteered to help us with our Twitter page. We have started sharing our news on the twitter board and will soon be posting our tweets on our Twitter page on the computer! Having lots of fun with technology! Definitely something to tweet about! More AR Fun! Twitter Too! 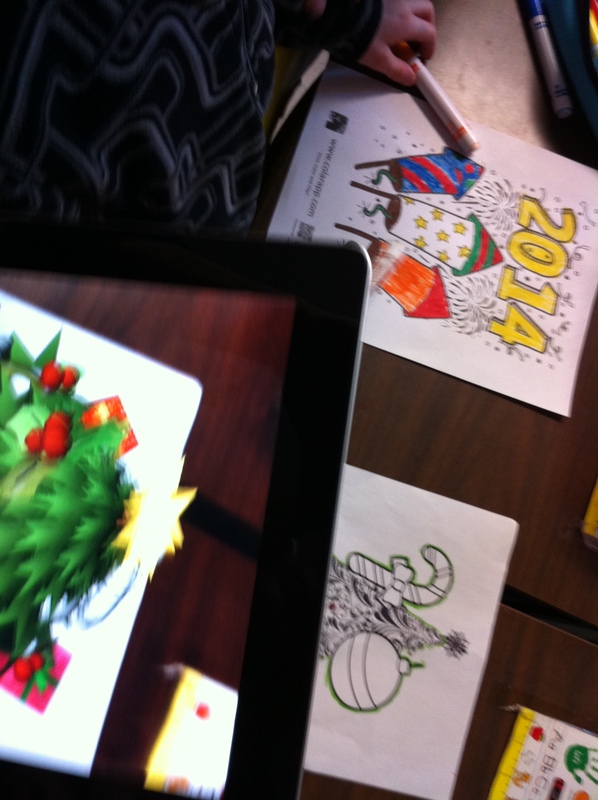 I couldn’t resist passing out the new CoLAR augmented reality coloring pages! I know this is a Christmas tree but isn’t it awesome! This is the one for Happy New Year! 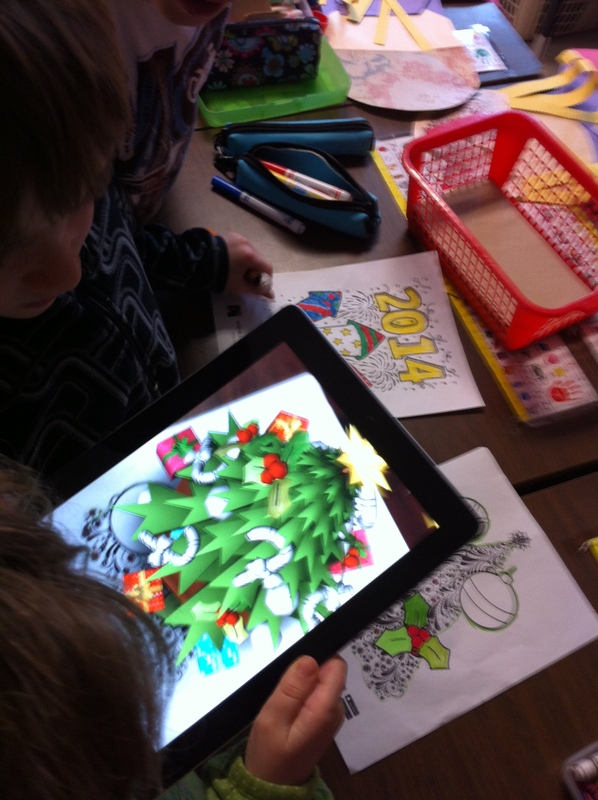 I wish you could see and hear the children’s responses when we hold the iPads over their coloring pages! You can see the coloring page in the back of this picture. When you open the CoLAR app and hold it over the picture the rockets and numerals pop out at you! It is magic! Entirely too much fun! 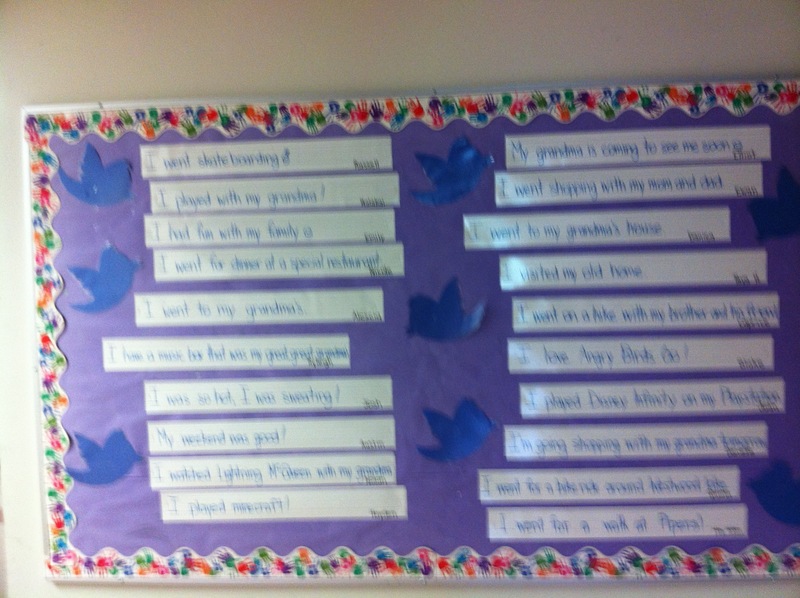 This is our hallway “twitter board”. 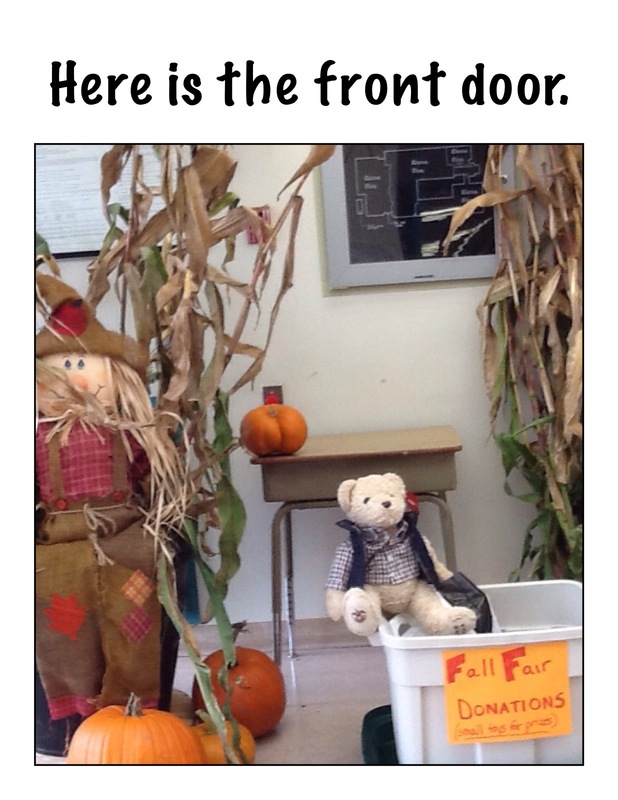 Each week we will be posting our classroom news! We also have a real Twitter account that I created last year. 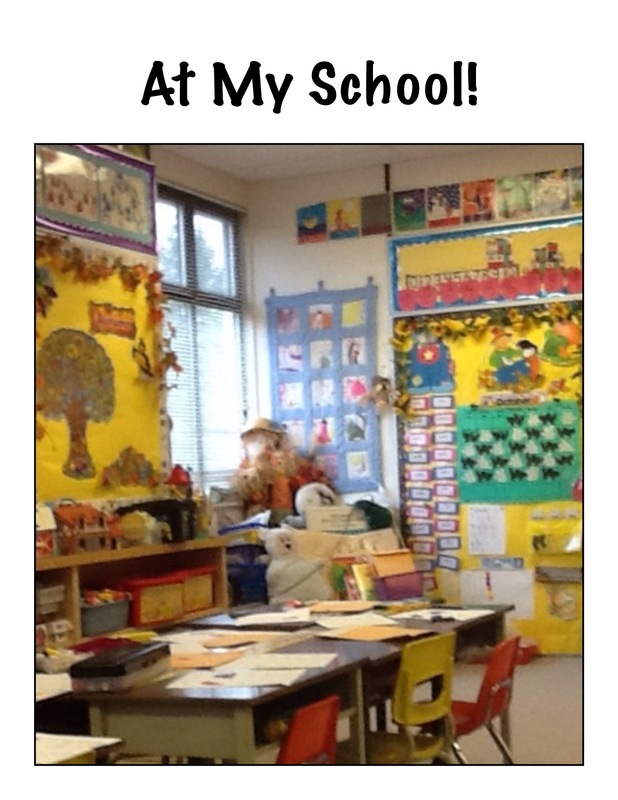 All the blog posts are tweeted out on this page and we have started to tweet about events in our class! You can follow us on Twitter but as it is a protected account you need to put in a request to follow us. We got mail! This is just some of it! I had forgotten how much fun it is to get mail! The old-fashioned kind! 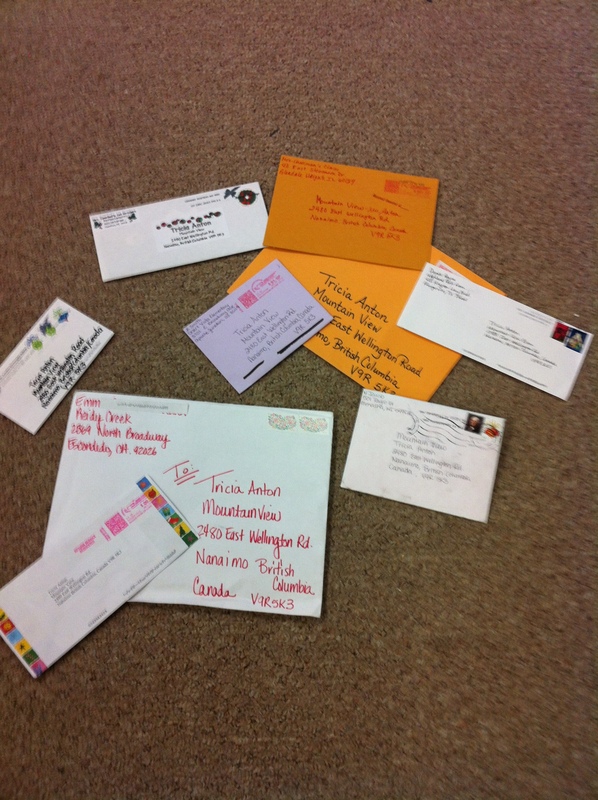 This is some of the mail we got from our Christmas card project! The children loved hearing about all the different schools and classrooms! I am trying to figure out a way to show you our mail and show where it all came from! 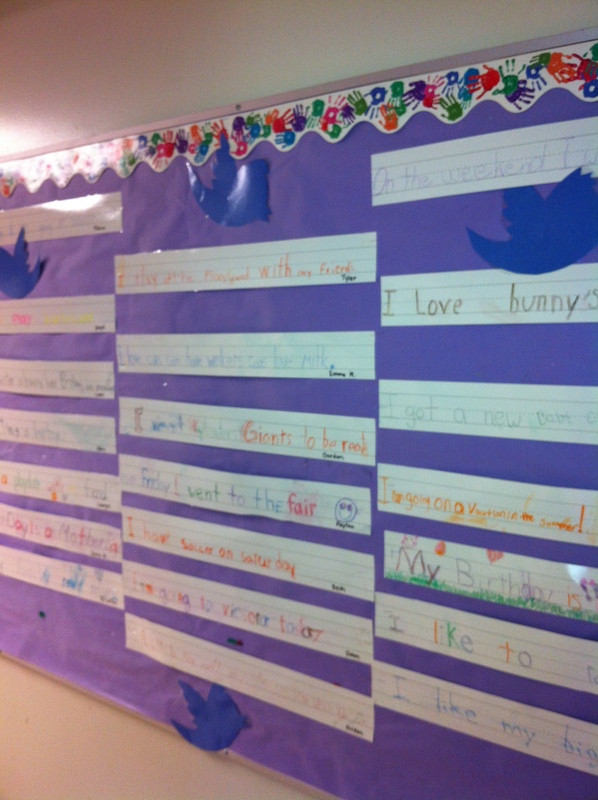 A week ago we made a twitter board with our buddy class! 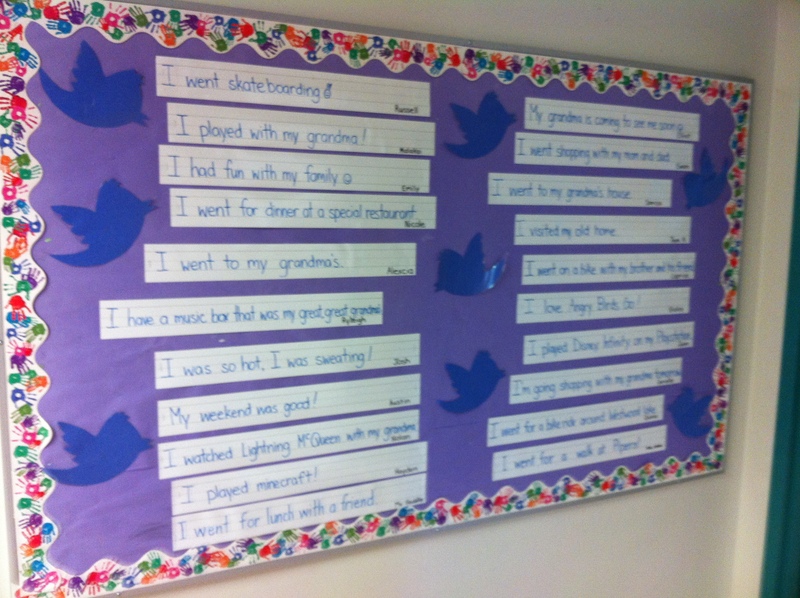 They had created a twitter bulletin board with “tweets” about something they wanted to share! Really interesting to read and find out about what’s important to them right now! So they showed us how to do it! The children are writing on their own personal strip each week and sharing something important to them! An upscale “show and tell”! 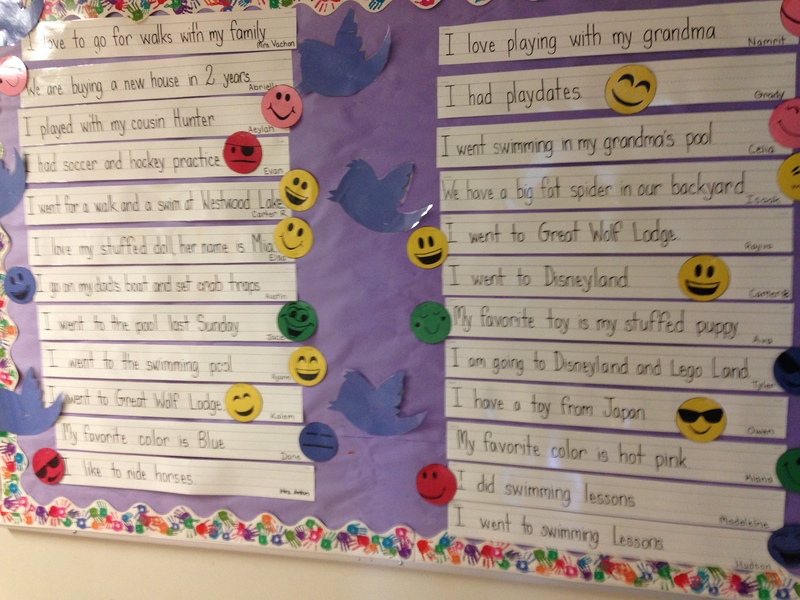 The bulletin board “twitter board” lets each child share their important moments. I have been researching class twitter boards and decided to take the plunge this week! We now have our own Twitter account. It is a protected account. That means that to post to the account I must approve the comment. That protects us from posts that are not appropriate. The blog posts are also posted on the Twitter account! 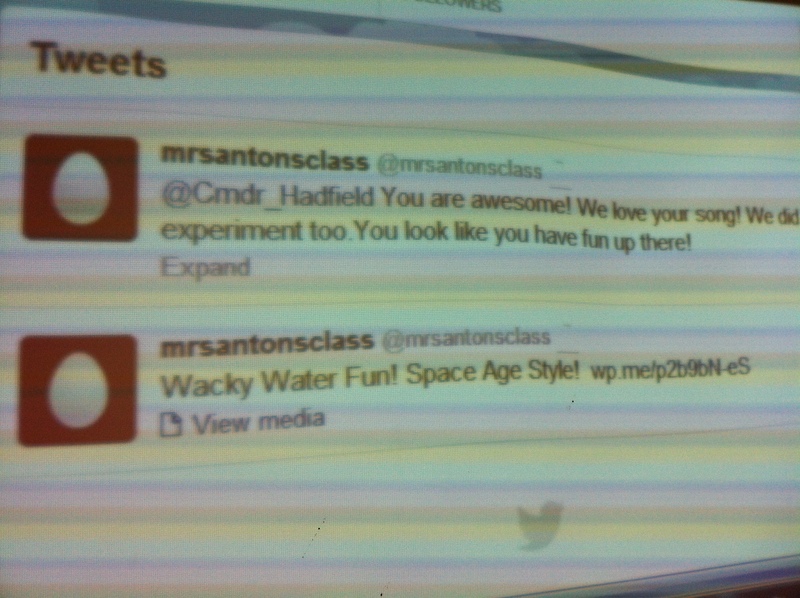 We tweeted to Chris Hadfield to let him know that we enjoyed his videos about life on the space station. 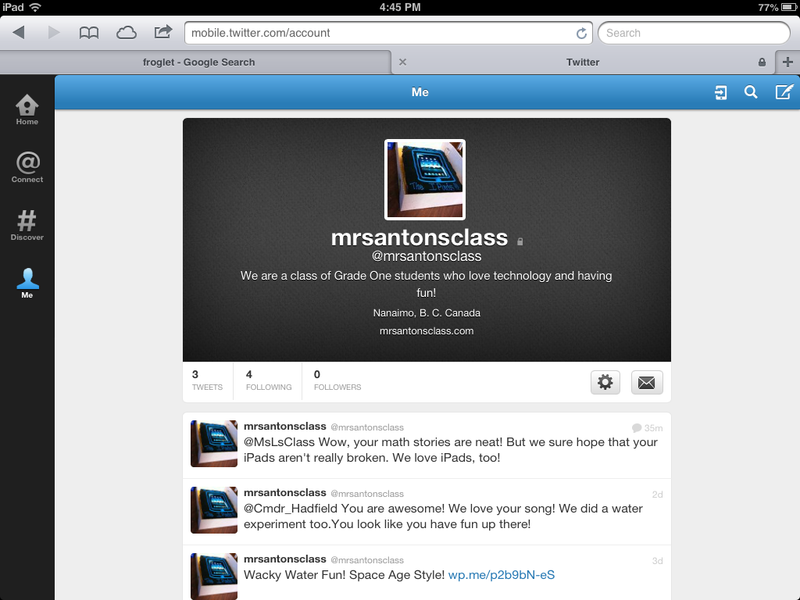 We also tweeted to another class that has a Twitter account. There are some really neat uses of Twitter that we will be exploring in the future. 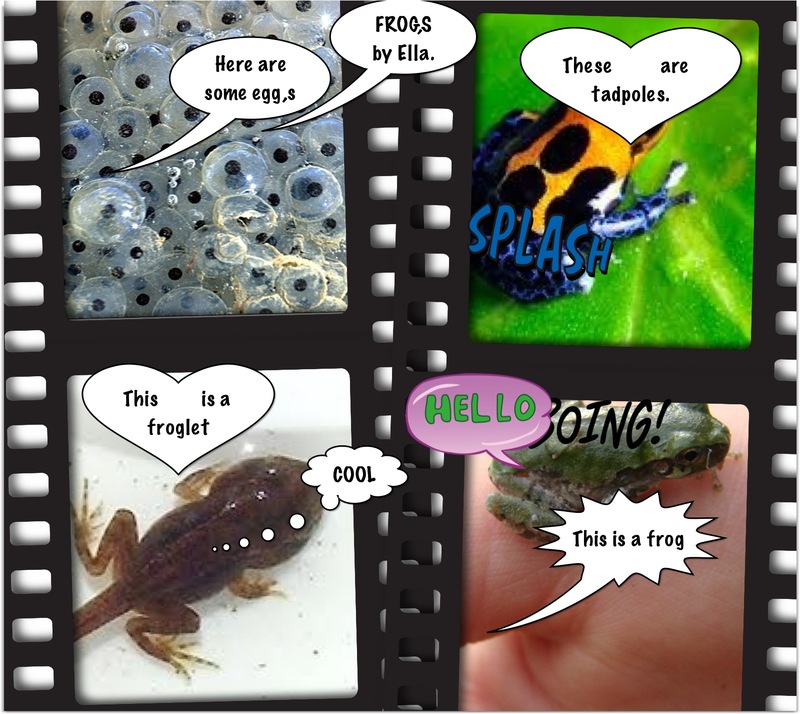 The children are continuing to create their frog life cycle pages on the iPad using the images that I have downloaded for them and Strip Designer. When they are complete I will figure out some way to share them with you! Here is another sample that is complete! Love the Hello and Boing! 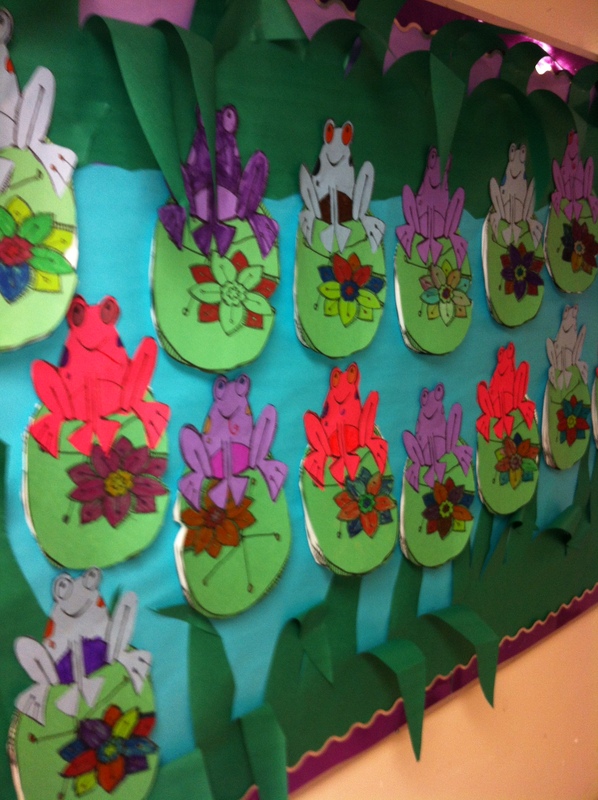 We did a research project on frogs this week! 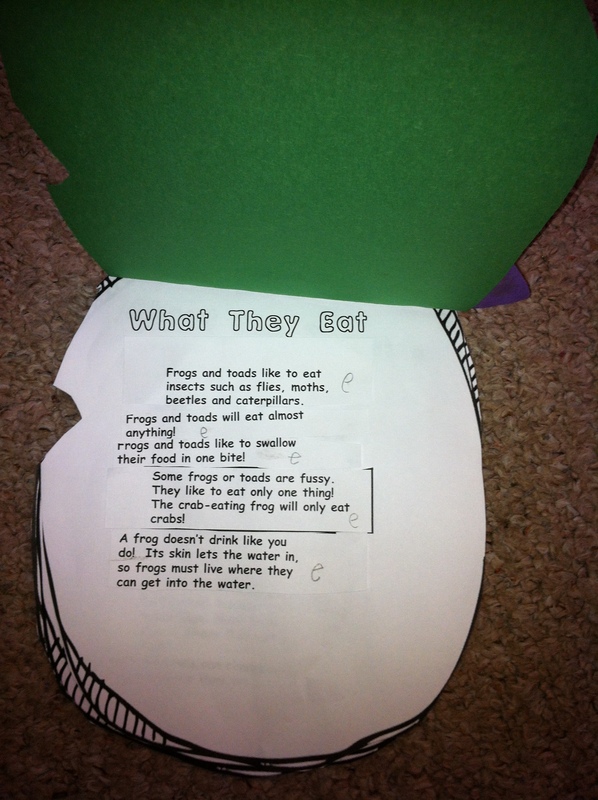 The children had to sort facts about frogs into four different categories. We read them and decided which category fit the best. I was so proud of their reading. Some of the words were hard! They did a great job! 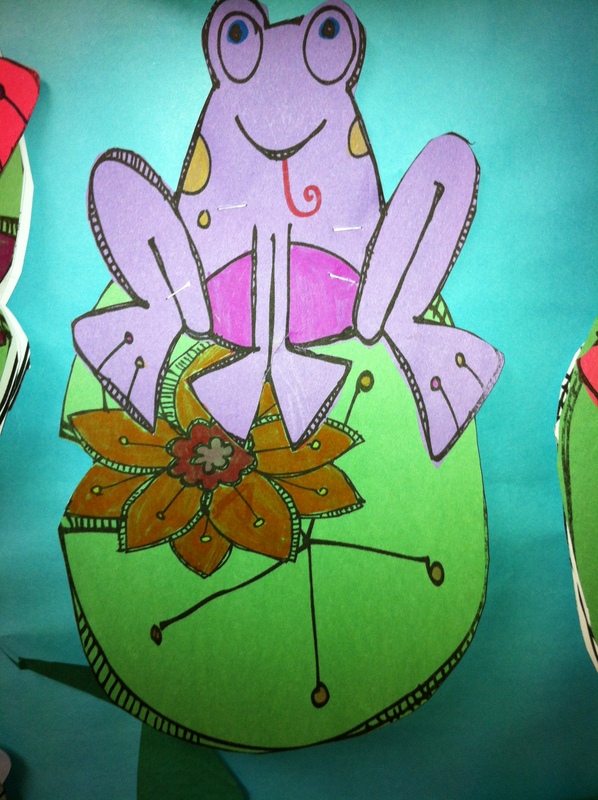 We are collating all our frog stuff into a frog folder!